Colorado Law sponsors study abroad programs for our law students to help them understand the international community and to prepare them for an increasingly global legal market. These programs seek to provide students with greater understanding of international and comparative law; to offer exposure to the legal, social, political, and cultural environments of the relevant countries; and to enable students to help clients and communities address the increasingly complicated legal demands of our global community and its multiple legal systems. In addition, Colorado Law students may apply to attend any ABA-accredited study abroad program or may work with the Dean's Office to design a custom study abroad program tailored to their specific interests. For further information regarding credit transfers and other curricular concerns, please contact Colorado Law's Director of International Programs, Mr. Jimmy Ilseng, at: jimmy.ilseng@colorado.edu. For more information about study abroad at CU-Boulder generally, visit the Study Abroad Programs website. The University of Colorado has recently approved the Bucerius Summer Program for Colorado Law students, giving students the opportunity to take courses for their Colorado Law degree in Hamburg, Germany. Since 2008, Bucerius Law School has been offering the Bucerius Summer Program in International Business Law, an intensive four-week course taught in English for international and German law students and graduates. The aim of this program is to impart knowledge and ensure that the participants understand the forces shaping international business law. This will help students meet the increasing demands of companies and law firms in this field. The program is open to law students and graduates from all over the world. Applicants must have completed at least one year of legal studies. Hamburg is the second-largest city in Germany, located in the north, 70 miles inland. Media and music comprise a large portion of Hamburg's industries, and it is home to many universities, bringing students from all over. Hamburg prides itself on more than 30 theaters, six music halls, 50 state and private museums, and more than 4,000 restaurants. To Apply: For application deadlines and to apply, click here. For questions, contact please contact either Mr. Jimmy Ilseng or Ms. Cindy Kraft. The Bucerius Exchange Program is a fall-semester program available to law students from nearly 30 countries worldwide who have completed two years of law school and wish to broaden and extend their understanding of the forces shaping international, comparative, and domestic law. Program participants work closely with academics and experienced practitioners to gain insight into legal practice and explore current topics within German, European and transnational frameworks. Courses: Classes are taught in English, and students with proficient German-language skills are welcome to sit in on regular classes taught to Bucerius students in the German LLB program. The program is divided into two sessions, each session extending over six weeks, followed by an exam week. Some courses are offered for the duration of the session or term; others are offered as three- or four-week compact courses. Most courses are worth 2 credits. In these courses, experienced Bucerius and international professors, as well as legal practitioners, bring the world of German, European, and international law and legal practice to international students. The minimum course load is 4 credits per session and 8 credits during the program. The course credit system is based on the guidelines of the ABA. Students may select as many courses as they want but should consult with Colorado Law regarding the transfer of credits and any additional course load requirements. 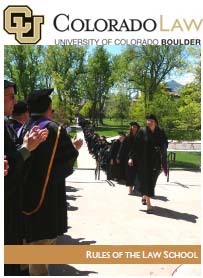 The acceptance of credit for any course in the program is subject to determination by Colorado Law. To Apply: For application deadlines and to apply, click here. For questions, please contact either Mr. Jimmy Ilseng or Ms. Cindy Kraft. The Comillas Exchange Program is a fall-semester program available to law students from approximately 50 countries worldwide who have completed two years of law school and wish to broaden and extend their understanding of the forces shaping international, comparative, and domestic law. Program participants work closely with academics and experienced practitioners to gain insight into legal practice and explore current topics within Spanish, European and transnational frameworks. Courses: Colorado Law students have the option of enrolling in regularly offered Comillas exchange courses, which include a mix of courses taught either in Spanish or English, in addition to potentially enrolling in courses in the LLM in International and European Business Law program. The normative semesterly workload at Comillas is 30 ECTS credits, but exchange students can enroll in up to 35 ECTS credits. The acceptance of credit for any course in the program is subject to determination by Colorado Law, and students participating in this exchange program will consult with Colorado Law's Director of International Programs regarding the transfer of credits. To Apply: We anticipate our agreement with Comillas to be finalized in fall 2018. The online application for fall 2019 will be available soon afterwards. The four-year Juris Doctor/Bachelor of Laws (JD/LLB) offered in cooperation with the University of Alberta Faculty of Law, Canada, prepares graduates with the credentials needed to practice law in both Canada and the United States. Colorado Law students study for two years at Colorado Law and two years at the University of Alberta (U of A). The 90-year-old U of A has areas of strength in natural resources law, energy law, constitutional law, health law, business law, jurisprudence, and the law of indigenous peoples. It boasts a collegial atmosphere amongst the 525 students and the faculty of 40-plus professors. In addition, the admission standards for the two law schools are identical. In North America, foreign trade has become more common for even the smallest business, and a need for lawyers versed in multiple legal systems has emerged. According to the Office of the United States Trade Representative, from 1993 to 2007, trade among the NAFTA nations more than tripled, from $297 billion to $930 billion. Additionally, business investment in the United States has risen by 117 percent since 1993. Law degrees from both countries allow graduates to serve law firm clients conducting transnational business in North America and beyond, offering them a distinct advantage in this job market. National law firms are becoming global firms, representing international securities firms, investment management companies, and other financial institutions on transnational regulatory issues. A lawyer with this dual degree has expertise in cross-border securities, transactional law, commercial law, insurance litigation, subrogation, recovery, immigration law, real estate law, or energy and natural resources law. Requirements: 89 credit hours are required for the Colorado Law JD degree, with at least 32 credit hours taken in residence at Colorado Law; 92 credit hours are required for the University of Alberta Law LLB degree, with at least 60 credit hours taken in residence at University of Alberta Law. Students must earn a C or better in each course for the course to be acceptable for credit at each school. To Register: Colorado Law students must apply separately to the University of Alberta Faculty of Law's LLB Program through its Admissions Office. The application deadline is November 1, and the LSAT is accepted. Students should contact the CU Law Dean's Office to begin the application process.